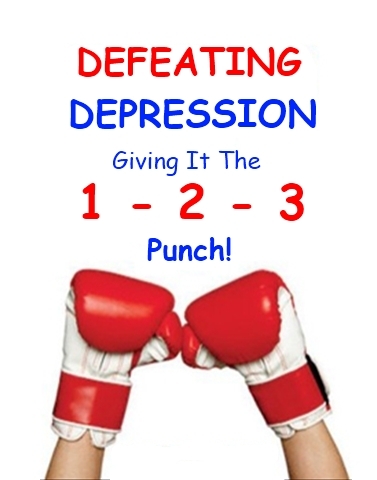 Depression Hurts But You Can Fight Back Learn How To Defeat Depression Today! Does Your Life Feel Overwhelming? Days, Weeks, Months And In Many Cases Years! Now I Can Help You! My name is Howard G. Platt 111 and back in August of 2008, I decided to create this website because I had a story to tell and I knew that I could inspire and help others and that is what I set out to do. I’ve had my share of challenges in this life and no matter how bad things became I never gave up and I have always battled my way through them and come out on top. I would like to use my experiences to help others, not only with depression but with a host of medical challenges that would cripple most people both physically and mentally. Throughout this site, you will find articles covering all aspects of personal development but for now, I will just focus on the one illness/challenge that affects millions of lives every day; Depression! Depression Can Ruin Your Life If You Let It! I know what it feels like to not want to get out of bed in the morning. I know what it can do to your energy, your appetite, your self-esteem and most of all I know that it can make you feel like just giving up, throwing in the towel and calling it quits. I have been where you are right now, I felt worthless, like a burden to everyone around me I remember the anger, the quilt, the emptiness and worst of all the isolation. I Can Teach You How To Overcome Depression In 2 Weeks or Less! Now I realize that is a pretty bold statement but with my experience, I am certain that I can stand behind every word on this page. I have published hundreds of articles about Depression and I have helped hundreds of people win their battle with Depression and I know I can help you. Thank You for taking the time to sit through that video. I could have presented a slide-show message which would have been much easier for me and I imagine for you as well but I wanted you to see a real person with real problems and not just read some sales pitch. If you thought I was trying to play on your emotions you would be 100% correct! For 15+ years I had helped others to fight through their depression and I thought I knew every trick in the book but all it took was a simple little headache to show me that I was far from knowing it all. I’m not going to bore you with some long sob story although I will tell you about the day that caused me to question everything in my life. It was “The Day” I was told that I had a tumor on my brain, it was inoperable and I had less than 12 months to live. After receiving that news it wasn’t long before I was the one in need of help! That’s right, the guy that knew “Every Trick In The Book” for dealing with Depression could not help himself. After reading that you are probably wondering how I could possibly help you if I could not help myself. That is why I shot that video myself, you see the day that changed my life for good, well that was about 11 Years Ago (today being 5-17-2011) but the video above well that was just 3 Days Ago and I was still battling pneumonia which is something I must deal with at least 3 or 4 times a year due to the trach in my neck. 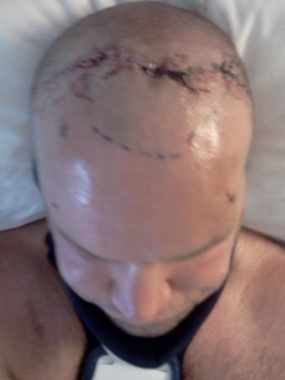 A little update; the picture to the left was taken the day after yet another brain surgery I had on 1-21-2013 after suffering a major brain aneurysm. I slipped it in here to let you know that even with my ongoing health challenges I still never struggle with depression. Prior to my illness I DID help a lot of people win their battle with Depression and I am still helping others to this day but my approach is much different. So why would I change what I was doing if it was working? I received my real education on Depression when I experienced it for myself. I never did seek help for my Depression, for the 1st month of my death sentence, I felt there was no need to try to fight it because it wasn’t going to change my reality. But then the fighter in me kicked in and I went to work on first Defeating my Depression and then on proving the doctors wrong. I was a competitive boxer until I was hit with my illness which has since been diagnosed as a rare genetic disorder with no known cure and only minimal treatment options. Anyway I know it was that competitive edge I had from the fighting career that gave me the strength to Overcome Depression and then to learn how to Avoid Depression altogether! Using My Methods It Took Me Just Under 2 Weeks To Turn My Whole Attitude Around And That’s What I’d Like To Teach You! From Someone That Has Been On Both Sides of The Illness? Nobody Knows How Bad Depression Hurts Unless They Have Gone Through It Themselves! For Just $12 You Will Be On Your Way To Happier Days! For Just $12 You Will Learn How To Stop Depression Dead In Its Tracks! It’s obvious that selling this eBook for just $12 is not going to make me rich although any sales I make will help to support this site plus I did not write the book to get rich I wrote it because I know for a fact it can help a lot of people. In this eBook, you will be getting my 20+ years of experience in Fighting Depression including my breakthrough discoveries that pulled me out of a very deep state of Depression in less than two weeks. Using my Depression defeating strategies you will learn how to beat your Depression on your own, no doctors, no pills and NO RELAPSES! The methods that I will teach you will strengthen your Personal Power giving you the Confidence to deal with any situation so if you feel something coming on you will know how to stop it in its tracks and if you don’t think it’s worth the $12 just send me an email and I will refund the money immediately and you can have the eBook for free. You will feel a tremendous sense of relief with your new found Confidence. I was told I had less than 12 months to live but by using these Depression Defeating techniques I took my life back! Isn’t It Time You Took Your Life Back! ACT NOW And You Can Be Depression Free In 2 Weeks Or Less!